Our latest iOS app update is now live in the App Store! 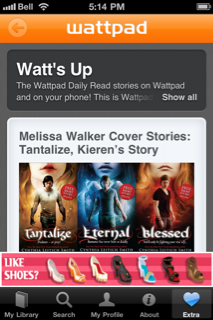 The biggest change you’ll notice is that you can now read The Wattpad Extra on the app; which highlights great reads, videos, articles, interviews and more. You’ll also see a new look to your library, which we think is cleaner and easier to use. We’ve fixed some of bugs and tweaked features that we thought needed improvement. If you don’t see the notice asking you to update your app, you can go to the app store and just download the newest version. Most of all, we want to hear what you think! Our Suggestions Box is always open and of course, if you download the app, leave your review in the app store!